Dumortierite is an aluminum boro-silicate hydroxide which belongs to the silicate class of minerals. 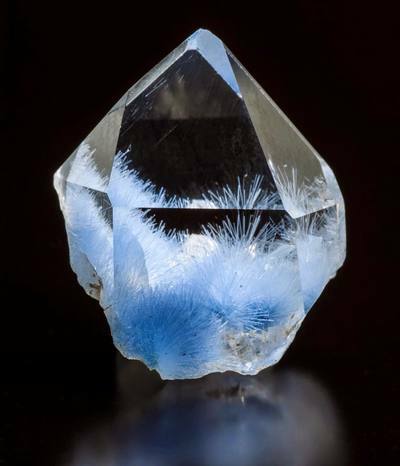 A variety of quartz called dumortierite quartz is clear quartz with inclusions of dumortierite. Dumortierite can be misidentified as other ornamental stones such as sodalite, lazurite and lazulite. Blue sodalite has more white portions and is much lighter in density. 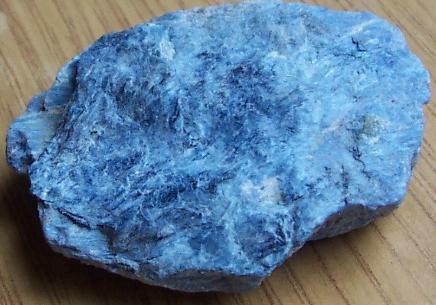 Lazurite and lazulite are not fibrous. In China, some dumortierite has been used as an imitation lapis lazuli in carvings. ​Dumortierite is named for the French paleontologist, Eugene Dumortier. It has a deep violet to blue colour that is very attractive and unusual. This stone can also occur as pink and brown. Although it is not used as a gemstone due to a lack of clarity, it does have good hardness and a bright colour. 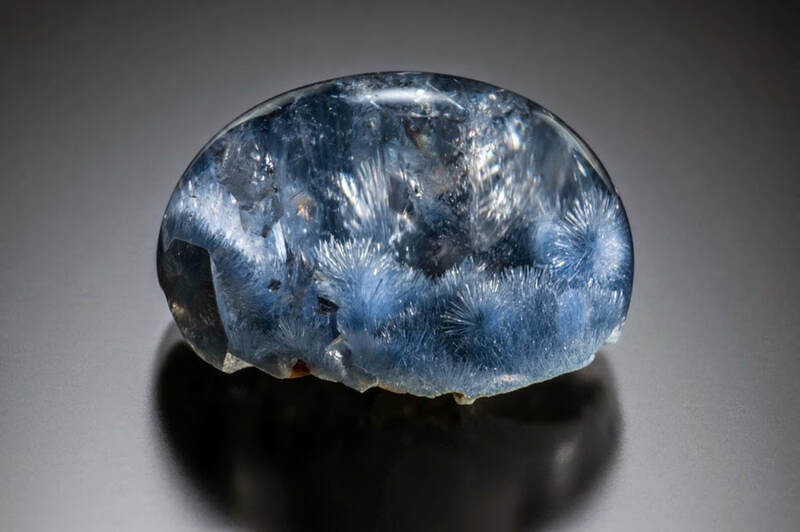 Dumortierite can occur in prismatic crystals which are translucent to transparent but is more commonly columnar or massive and are nearly opaque. Massive dumortierite can be carved into cabochons, beads, sculptures, eggs and spheres. Dumortierite is commonly found in aluminum rich metamorphic rocks and in some pegmatites. Dumortierite highlights the patterns that underlie addictions and compulsions so that the cellular memory is reprogrammed. It breaks the cycle of co-dependency, helping carers realise that they cannot cure the addict or control others addictive behaviour. ​​In healing Dumortierite is thought to be of benefit for headaches, hypersensitivity, epilepsy, diarrhoea, nausea, vomiting, cramping and colic. Placed gently on any affected area will also heal sunburn. fear, stomach ache, intestinal problems, depression, vomiting, gall bladder problems, painful throat, homesickness, carpal tunnel syndrome, sorrow, nervousness, operations, travel sickness, pregnancy, stress, grief and nausea. Dumortierite stabilises a rocky relationship and attracts a soul mate, although there may be difficult lessons to learn in the process. 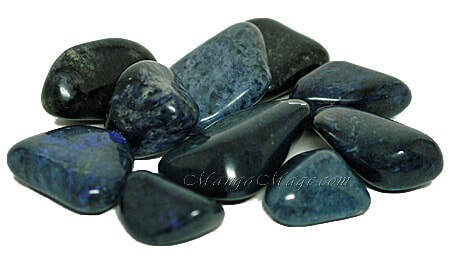 Dumortierite assists you in seeing the worth in each human being and reasons for the interaction. It highlights why you chose to learn through difficulties and challenges, and assists in thanking the other person for their role in your karmic learning process. ​​Opens and balances the throat chakra. It eases self effacement, shyness and stage fright. It enhances the ability to speak out and in speaking up for what you know to be real and true. Blue dumortierite fosters feelings of security, inner peace and certainty. This stone clears the throat and calms the mind. Dumortierite grounds your goodness so it can be seen, felt, experienced and enjoyed. It enables you to find the bliss within. This stone also reminds you that all is well when you know your truth and can speak and live it. Dumortierite assists in standing up confidently for yourself and adapting to functional reality, offering patience or courage and activating your instinct for self preservation by instilling unshakable self confidence. This stone is for calming over excitability, promoting detachment and opening positive self love and joy, it helps you remain young at heart with a constructive attitude to life. Useful for people who deal with crisis and trauma on a daily basis, it creates calm and focuses relief efforts. In addition Dumortierite is said to calm and focus you in traumatic situations giving you the tools to cope with a crisis. ​It is a good stone for meditation and supporting psychic communication with your spirit guides, angels, pets and other people. ​This stone repairs damage, tears and holes in causal body chakra. 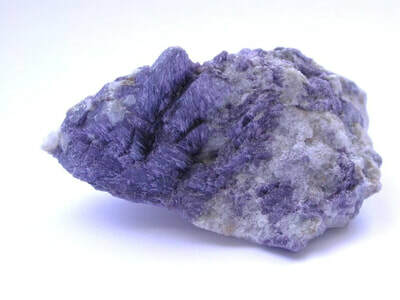 Purple dumortierite repairs damage to the causal body itself and its connections and system. It promotes communication and information from the Light,trance channelling and instantaneous transmission. Enhances the ability to learn higher truths. This stone opens advanced psychic abilities and the means to use them. Dumortierite is a tool to help you hear, sense or know divine intervention and information from angels, spirit guides and devic forces. Inner peace is found within the quiet centre of the third eye chakra, associated with this stone, Use it to realign your inner sight and when you are developing your spiritual awareness and psychic intuition, It is also beneficial to help you objectively observe you behaviours, tendencies, or challenging issues with clarity, Being objective enable you to make a positive shift toward more enlightened behaviours and actions.